In a change to its iOS App Store on Tuesday, Apple is now allowing users of older hardware to download and install the last compatible version of an app supported by their legacy firmware. The new app accessibility, first spotted by a user on Reddit, allows owners of older Apple products like the iPhone 3GS or 3G to download a compatible version of an app if the most recent update does not support their device's firmware. Previously, Apple did not offer downloads for older app versions, meaning users of legacy iPhones could not install apps updated past the handset's last supported firmware, which in some cases is years old. 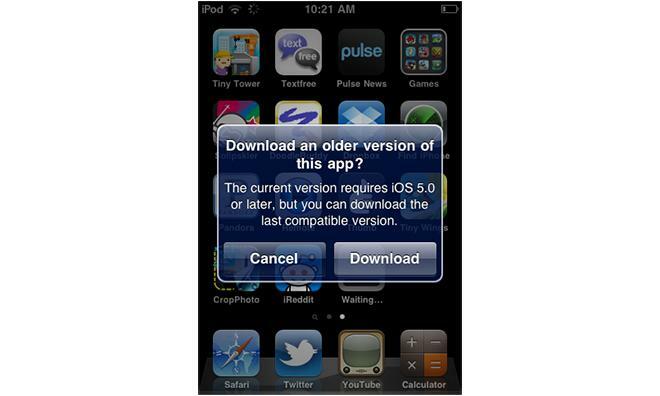 Under the new system, when a user attempts to install an app which no longer supports the legacy iOS running on their device, a pop-up will appear asking if they would like to download the last compatible version of the software instead. The feature extends the viable lifespan for aging iOS hardware that can't run the latest builds of Apple's mobile operating system. With the next-generation iOS 7 slated to launch on Wednesday, developers are pushing to get their software up to date with Apple's latest mobile operating system. As software updates follow in lockstep with the latest generation of hardware advancements, it is inevitable that the newest app versions will have features incompatible with older devices. Apple's iOS 7 will be available for download on Sept. 18, and will come be preloaded on future devices like the forthcoming iPhone 5s and 5c, both of which ship on Sept. 20.